For some, blogging is a job like any other. But for many, it is a way of life. And their personalities are reflected in their content. Like-minded readers find the bloggers that share the same interests by searching for them. For instance, a person looking for a week- end of adventure will find such con- tent from a person with similar inter- ests. Most content that finds its way to the Internet owes its origins to a blog- ger. Blogs are one of the oldest forms of social communication online, hav- ing made their advent in the late 90s. Blogs are distinguished by their fre- quent posts, written in a casual man- ner, and by the way they reflect their author’s persona. The degree of inter- action between the bloggers and the readers is high, making a blog a topic- specific network. The growth of blogging as a medi- um has encouraged many businesses to integrate blogging into their mar- keting models. Bloggers are brands in themselves. Most have some core expertise that people relate to. Some feature short stories or poems while others write about domains that a large number of people are interested in, like travel, food or technology. There are many who write about their real life experiences as well. The topics range from the best home rem- edy for a common cold to more seri- ous topics such as dealing with can- cer and domestic issues among oth- ers. Some bloggers like to spread the word on new things all the time and keep their blogs updated with the lat- est trends – and this is useful to brands. For example, on a good blog, a new restaurant would benefit from a blogger’s experience of the food. Any hungry soul looking for food on a weekend has a good chance of find- ing this restaurant through an Internet search based on his cuisine choice and location. This holds good for any experience like buying mobile phones to housing developments. In 2009, IndiBlogger, a blog promo- tion and networking platform that hosts the largest community of Indian bloggers, surveyed the state of the blogosphere in the country, and found a nascent but growing medium. Since that first survey, the blogosphere has come a long way in India, evidenced by the growth in registered bloggers on IndiBlogger itself, where membership has seen an increase by 450 per cent since 2009. In India, blogs have been the fast- est-growing medium across the web with an increase of 11.6 million read- ers (a 48I per cent increase) between March 2012 and March 2013 (com- Score), taking the total blog viewer- ship to 35.9 million readers. Even though the world wide web is global and common to all, the blog- ging scene in each part of the world is unique. This is because most blog- gers write about their own eco sys- tem. Blogs in different languages all over the world cater to a different audience. In India blogging in lan- guages like Hindi is very popular. There are some areas where bloggers compete on a global stage — technol- ogy, travel and news in general to name a few. One unique aspect of India is the diversity, which is well reflected in all its blogs considering the languages and culture. 2014, IndiBlogger set out to find the latest in blogging trends. We found that it is gaining importance with more experiences and opinions being sought out every day as people look for answers to many questions that affect their lives. With social net- works providing a very good foil for bloggers to promote their writing, their numbers are growing. When we contrasted the findings from our 2009 survey with the 2014 results, we found that the gender ratio of bloggers had improved from 22 per cent to 25 per cent; and Bangalore still leads with the most number of blog- gers, but Mumbai has now become the second largest, beating Chennai which held the second spot in 2009. We’ve also seen a healthy growth in Indic blogs (Blogs in Indian languages). From 8 per cent of the overall share then, it is now at 12 per cent. The share of Hindi in the category of Indic blogs has fallen to 43 per cent compared to 52 per cent then which has been driven by Tamil, Marathi and Telugu. Here are key findings from the 2014 survey, juxtaposed with findings from IndiBlogger’s own surveys conducted in 2012 and 2009. In our survey, we found that close to 75 per cent of all bloggers were male. This could be explained because of the skewed ratio of women using the internet in the country, which stands at 39 per cent, according to com- Score data. English continues to dominate as the language of choice although there has been a healthy growth of 12 per cent of regional Indian languages from 2012. Hindi still forms the major chunk with 43 per cent of all Indian blogs (5 per cent of all blogs) followed by Tamil at 23 per cent which forms 2.7 per cent of all blogs. 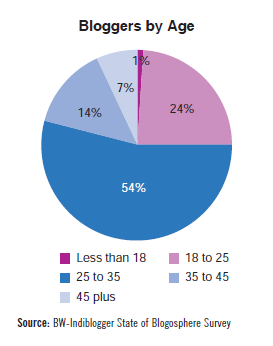 The majority of bloggers fall in the 25- to 35-year-old age group followed by 18- to 25-year olds. This is in line with the overall inter- net subscriber age group representation, where 25- to 34-year-olds makes up for the biggest chunk at 39 per cent. Going by the number of bloggers from a particular geographical location, Bangalore leads amongst the cities, thanks to a huge number of technology bloggers, followed by Mumbai which mostly attributes to lifestyle, fashion, beauty and enter- tainment blogs. 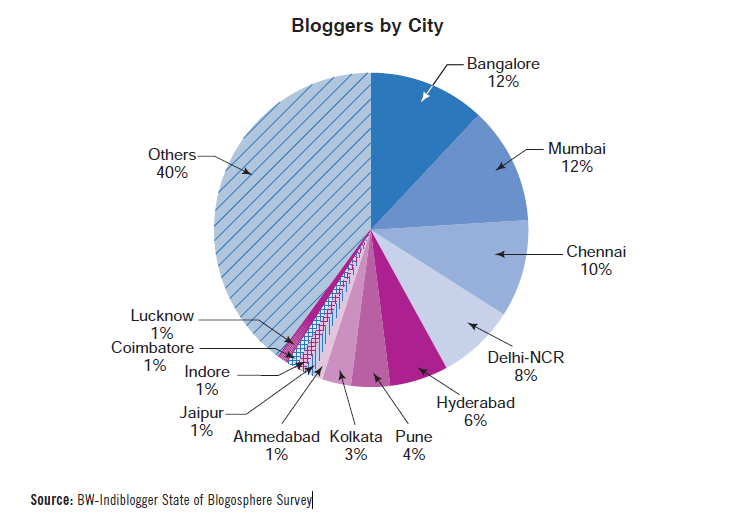 Amongst non-met- ros, Ahmedabad leads the pack with most registered blogs. What are bloggers talking about? The most blogged-about subject cat-egory has been Food and Drink fol-lowed by Travel, for the period 2008 to 2013. Technology, Personal Care, Books and Fashion have also been seeing a steady flow of posts from the bloggers, driven primarily by the strong marketing and PR spends by various brands. Compared to 2012, the fastest- growing categories have been Health, which grew at 90 per cent, Elections at 83 per cent, owing to the general elections and the run up to it involv- ing major parties and Prime Ministerial candidates. For the first time, campaigning was heavily sup- ported on social media including official blogs followed by Gadgets at a close third at 81 per cent growth over the previous year. Family and Parenting saw a healthy growth of over 50 per cent, which was driven by the growth of bloggers in the age group of 35 years and above. A steadily increasing number of blog- gers are using social networks to pro- mote their blog’s content, improving their networking quotient. It comes as no surprise that a whopping 44 per cent of Indian bloggers use Twitter to promote their blogs. The reason why Twitter is higher than Facebook could be because it allows bloggers to track and measure effectiveness. 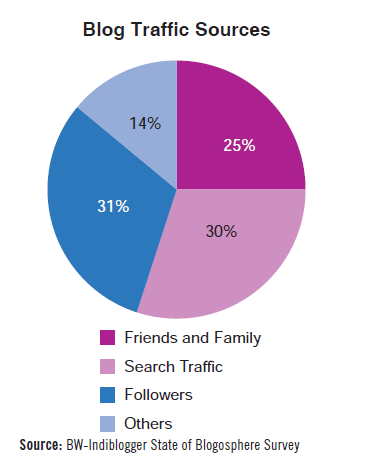 Secondly, Facebook is a closed network, but Twitter is not which is why it gains preference, being more search-friend-ly. 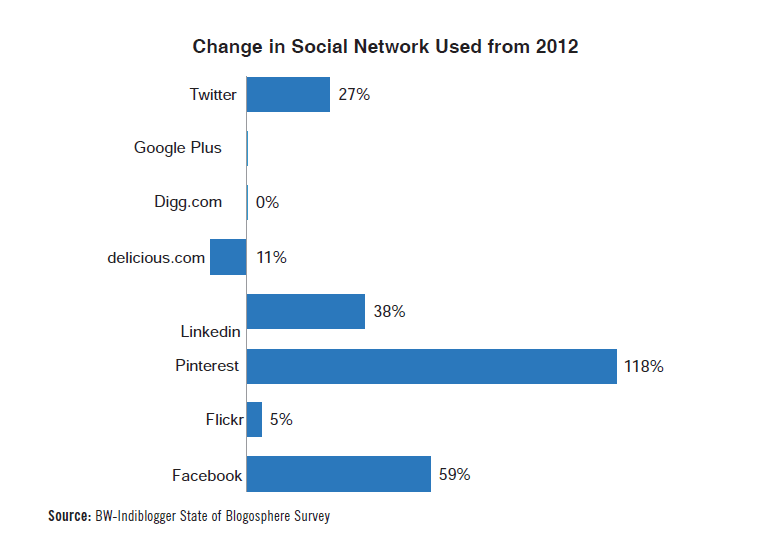 Facebook followed second with 28 per cent which was driven by bloggers using Fan Pages to reach their read- ers. However with the introduction of embeddable posts from Facebook, there has been an increase of 59 per cent from 2012 for Facebook which allows them to cross post to their respective blogs. Adoption of Pinterest still remains low at 8 per cent, but it saw the high- est growth amongst all social net- works from 2012 at a fantastic 118 per cent. Pinterest has gained immense popularity because the use of images drives home the content posted by many Food, Lifestyle, Travel and Fashion bloggers. The use of LinkedIn is still low at 6.4 per cent because business networking via blogs has not caught on in a major way yet. 56 per cent of all bloggers strongly believe that their blogs influence buying decisions which also means that a major- ity of bloggers blog about brands, products and services. 22 per cent of the bloggers write about their professions. 45 per cent approached by brands or agencies mainly because blogging is increasingly been seen as mainstream media platforms. Amazon.com/amazon.in leads the affiliate program with a 64 per cent share followed by Flipkart at 31 per cent share. Only 8 per cent of all blogs use an affiliate marketing program. But we expect this to go up con- siderably with the increase of e-commerce and growth in reach. Although the majority of bloggers use a desktop; the advent of smart- phones clearly made a mark with 24 per cent of the bloggers using a smartphone to publish content. Interestingly, only 3 per cent blogged from a tablet but we expect that to increase. 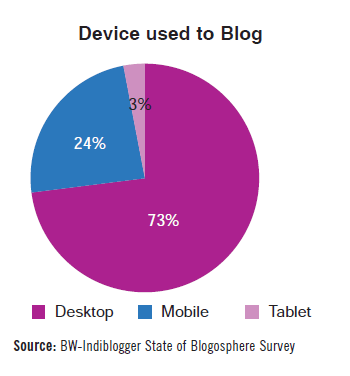 Chrome is the browser of choice for most bloggers with a 50 per cent of them using it. Google’s blogspot. com holds around 63 per cent Indian blogs. Google Analytics continues to be the most popular tool bloggers use to study and understand their readers with a share of 68 per cent. This is driven by the strong ecosystem Google has built for bloggers with Chrome, BlogSpot and Google Analytics. Blogging habits, style, management and presentation The majority of bloggers continue to blog articles, but 44 per cent indicat- ed that they have used videos in their blogs. One fifth of all bloggers use poetry, short stories and photos to present their content. This could be attributed to increase in creative writ- ing and more bloggers aspiring to become published authors. 35 per cent have published guest blog posts on their own blog which shows how bloggers have also been actively net- working with each other. 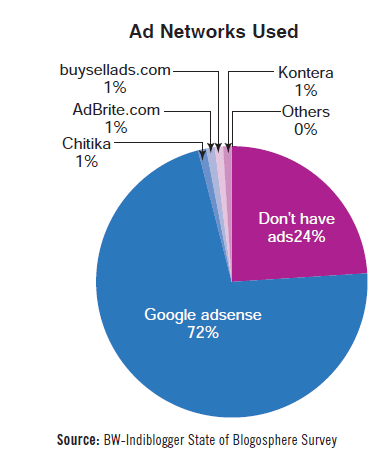 43 per cent link to other relevant blogs from their own site to share readership. 60 per cent of the traffic to all blogs comes from either search engines or from immediate followers. This can be attributed to the growing search traffic which grew at 28 percent over the past year at 67.5 million making India the 4th largest in search volumes, according to comScore data. Most blogs continue to be man- aged individually although we have been seeing a growth in multi-author blogs (MABs). We see this number going up because more bloggers are entering the professional blogging space which needs higher number of contributors to present up-to-date news and information. A quarter of the bloggers enjoy the anonymity that blogs have to offer that comes from only sharing non-personal information. 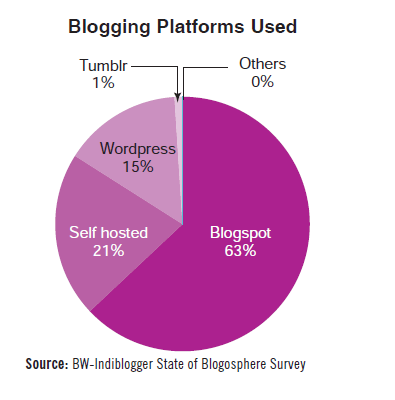 Indian bloggers are an active lot with 59 per cent blogging at least once in a month. One third of the blogs received high interaction on their blogs with over 5 or more comments from readers. 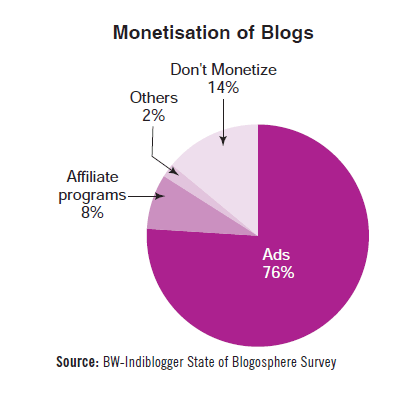 State of the Blogosphere is a joint survey done by BW | Businessworld and blog promotion and networking platform IndiBlogger.in. The survey was conducted between December 2013 and January 2014. 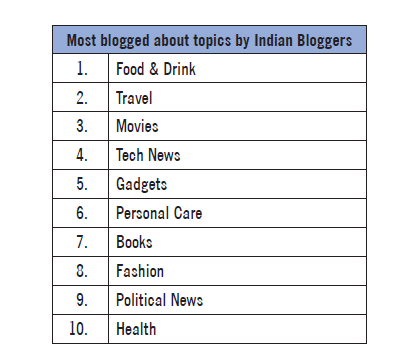 The data has been col- lected from a sample of 35,464 human-verified blogs from the IndiBlogger.in database. 1059 bloggers on the IndiBlogger network also responded to a questionnaire of 12 queries which helped in the understanding of specific behavioral characteristics. 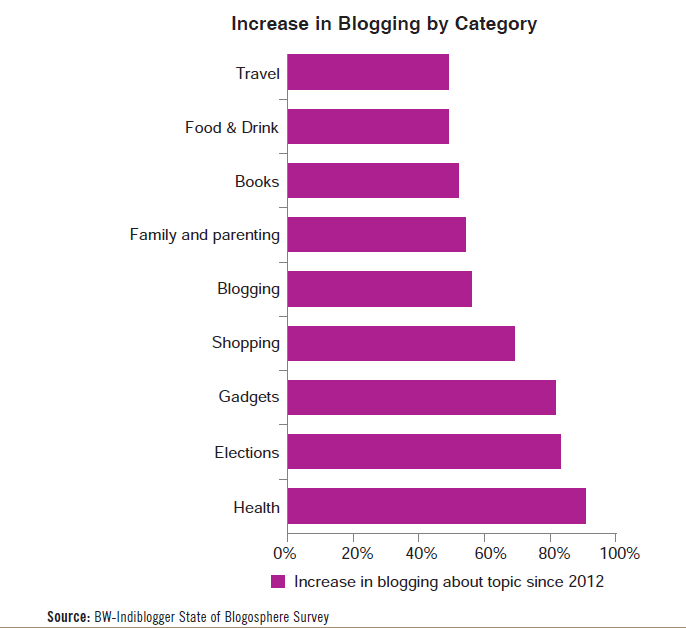 The study also includes 318,059 blog posts submitted on IndiVine™ since 2008 to understand blogging behavior, categories, topics and writing styles.